What is a glass collector to do when setting up a kitchen? Shopping at Wal-Mart and paying $30 for a boring new casserole dish just irks me. And plastic reamers? Ick. You just throw them away and buy another one in six months. It’s so much nicer to have a lovely old glass one to treasure as well as use. The logical answer to this dilemma is Fry Ovenware. Made mostly in the 1920s, the Pearl opalescent color goes so perfectly with my other Deco era opalescent art glass, I almost want to just display it with the rest of my collection; although using it is much more satisfying. For example, I just got a set of Fry Pearl custard ramekins, and that very day one of my friends showed up at the door with a fresh batch of homemade sushi. The custard cups were just the perfect size for filling with wasabi mustard and soy sauce to dunk each roll in. H.C. Fry would probably roll over in his grave. Henry Clay Fry worked with glass his whole life, eventually founding what became the H.C. Fry Glass Co. in Rochester, Pennsylvania in 1901. When the company first opened, it produced some of the finest Brilliant Cut glass of the day, with one of Libbey’s top designers, H.G. Garrett, furnishing many of the designs. Of course, American Brilliant Cut glass had its day in the sun, but fell rapidly out of fashion during the teens as tastes veered away from ostentatious ornamentation favored in Victorian and Art Nouveau times and turned more toward the slick mechanized Deco look. In 1921 the Pearl colored ovenware was introduced. The attractive line was intended to double as both cooking and serving dishes. While I’m not sure I am convinced by one of the advertising claims of the day that ‘it even improves the flavor of food!’ I can vouch for the attractiveness and durability. The pieces I use in my kitchen today have lasted longer than most members of my family have. Aluminum oxide was the key ingredient in the glass that produced the bluish fiery color of opalescence, and the amount of the chemical and thus the strength of color varies- “moonbeams caught in a web of glass” was the florid description in women’s magazines. The advertising worked, though, and soon Fry Ovenware was a “must” for the modern homemaker of the twenties. The line included casseroles, bean pots, grill plates, and many sizes and varieties of baking dishes. While they made juice reamers and measuring cups too, most everything was intended to be used inside the oven (rather than mixing bowls or teakettles for example, which were not produced). There was variety in the Pearl line as well; etched accents and one molded grape design were included as well as multicolored enameled details. Personally, I like the unornamented blanks, but it’s a matter of taste. Some of the pieces also had flashed color like yellow, green or blue over the Pearl. There was even a child’s toy baking set. Some casserole dishes came with fancy chrome holders, with Bakelite handles. 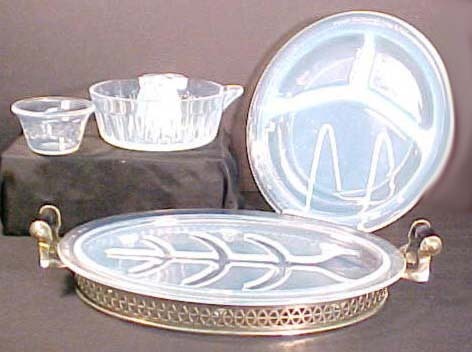 The success of the Ovenware lead to tableware in Pearl, like relish dishes, snack trays with cups, butter pats, and even a baby bottle. It should be noted that the numbers on the bottom of most Fry Oven and kitchenware is not the date, it’s the mould number. They are a bit confusing, as numerically they fall between 1916 and 1976, so it’s easy with many of them to assume it is a date- which it is not. The mould number is often followed by a dash and another number: the measurement of the piece. So, a casserole marked 1920-6 would be mould number 1920, measuring 6 inches across. Fry Foval is a name familiar to many collectors of art glass of the ‘20s and ‘30s. Comparable in quality to Steuben and the like, it was mold blown and elegant. However, its roots were in the more utilitarian Pearl Ovenware. The basic color of Foval was Pearl opalescent, though it often had blue or jade green applied handles, rims, or feet. Generally, Foval was unmarked. 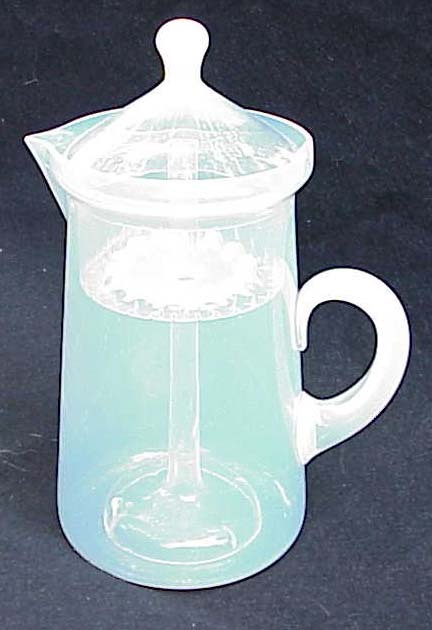 One fascinating transitional piece between the utilitarian kitchen glass and the Foval art glass was the Foval coffee percolator. It was entirely made out of opalescent glass, basket and all. The hand finishing, including fire-polishing and grinding of the pontils, made Foval quite costly both for the consumer and the company itself. It was produced only between 1926 and 1927. Some references cite its cost to the company as contributing to the eventual demise of the H.C. Fry Glass Co. Henry Fry died in ’29, and the company struggled through the Great Depression, and eventually was sold to the Libbey Glass Co. in ’33. Certainly Fry Ovenware has never been outdone in attractive functionality; give me an old Fry baking dish any day over a brand new one. While trickier to find, generally they’re not that much more expensive than brand new high quality kitchenware. And it’s so much more fun to hunt for the elusive Pearl measuring cup at antique shops rather than drive down to the local strip mall and fight the hordes of suburban shoppers. Maybe it doesn’t make food taste better, but it sure does make it more fun to eat.